This morning, the Skerries Coast Guard team paid a visit to all the Fingal lifeguard stations in our response area. This included lifeguard stations at Donabate/Portrane, Rush, Skerries & Balbriggan. This weekend marked the start of the summer season for the lifeguard beaches. 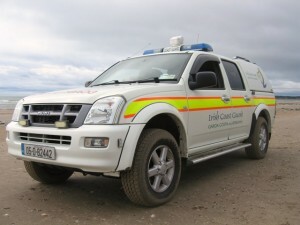 The Skerries team distributed safety posters and Coast Guard “missing children” wristbands to the lifeguards. Despite the sunny weather, the fresh gales deterred all but the kitesurfers from heading out on the water. Remember – you should always swim at beaches where lifeguard are on duty and do heed their advice for the prevailing conditions. This entry was posted in Media, water safety by Skerries Coast Guard. Bookmark the permalink.